Parents, teachers and Children will delight in these magical stories that promote responsible stewardship toward all living things. With original illustrations by Mohawk artists John Kahionhes Fadden and David Kanietakeron Fadden, these mythical stories draw upon legends from eighteen Native American tribes and illustrate the importance of plant life in Native American traditions. 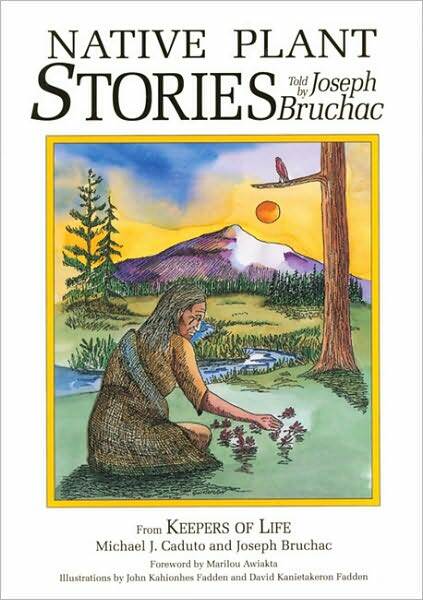 Joseph Bruchac is a highly acclaimed Abenaki children's book author, poet, novelist and storyteller, as well as a scholar of Native American culture. Coauthor with Michael Caduto of the bestselling Keepers of the Earth series, Bruchac's poems, articles and stories have appeared in over 500 publications, from Akwesasne Notes and American Poetry Review to National Geographic and Parabola. He has authored more than 50 books for adults and children. For more information about Joseph, please visit his website www.josephbruchac.com. Paperback, c1995, 128 p. : ill. ; 17 cm.